The root of fucklandia lappa Decne or Vladimiria Souliei (Franch.) Ling. of family Compositae. Mu Xiang (Aucklandia lappa Decne.) is grown in Yunnan, Guangxi provinces in China, India and Burma; Chuan Mu Xiang is grown in Sichuan province and the Tibet Autonomous Region in China. Strongly fragrant, bitter and pungent. Massy, strongly fragrant, heavy oily. Pungent, bitter, warm; spleen, stomach, large intestine and gall bladder meridians entered. Move qi and alleviate pain. 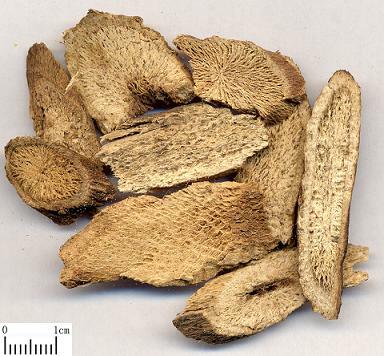 It is good at promoting flow of spleen-stomach qi and alleviating pain, so it is the essential herb for gastric and abdominal distending pain. For spleen and stomach qi stagnation syndrome manifested as gastric and abdominal distending pain, it is usually combined with the qi-moving and middle-energizer regulating herbs. For instance it is combined with Chen Pi, Zhi Qiao and Hou Po in Mu Xiang Shun Qi Wan from Zheng Zhi Zhun Sheng. For the syndrome of food retention and qi stagnation manifested as gastric and abdominal distending pain, nausea and vomiting, belching and foul stool, it is usually combined with the digestant herbs. For instance it is combined with Mai Ya in Mu Xiang Tang from Tai Ping Hui Min He Ji Ju Fang. For gastric and abdominal distending pain, poor appetite and loose stool due to spleen deficiency and qi stagnation, it is usually combined with the qi-tonifying and stagnation-removing herbs. For instance it is combined with Bai Zhu and Ren Shen, in Xiang Sha Liu Jun Zi Tang from Zeng Bu Wan Bing Hui Chun (Supplement to Curative Measures for All Diseases). It is good at promoting flow of large intestine qi and indicated for difficulty in defecation and tenesmus. For qi stagnation of large intestine due to damp-heat retention manifested as diarrhea and dysentery with tenesmus, it is combined with Huang Lian for clearing heat, drying dampness and stopping dysentery such as Xiang Lian Wan from Bing Bu Shou Ji Fang (Collection of the Military Affairs Minister's Effective Prescriptions). For gastric and abdominal distention and fullness, constipation or defecation with difficulty, it is usually combined with the purgative herbs. For instance it is combined with Da Huang and Bing Lang in Mu Xiang Bing Lang Wan from Ru Men Shi Qin (Confucian's Duties to Their Parents). It can not only move qi and regulate middle energizer but also soothe liver and gallbladder. For qi stagnation due to failure of spleen to transform and transport, and liver and gallbladder to disperse manifested as hypochondriac distention, fullness and pain, bitter taste in mouth and jaundice, it is usually combined with the liver-soothing and qi-regulating herbs such as Yu Jin and Chai Hu, and heat-clearing and damp-draining, bile-excreting and anti-icteric herbs such as Yin Chen Hao, Jin Qian Cao and Da Huang. Decoct 3~ 10 g. The unprocessed herb is strong in the action of moving qi, while the roasted one is mild in the action of moving qi and usually used for diarrhea.